Palm Springs. 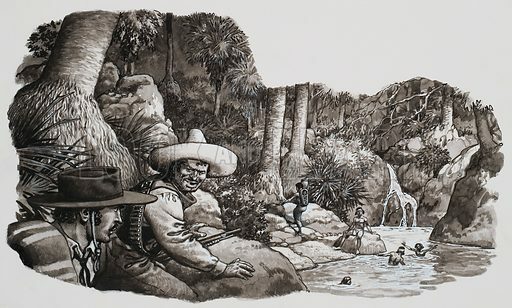 Spanish and Mexican travellers came across Indians enjoying hot springs in a delightful spot on the edge of the Colorado Desert, but was many years before this paradise was transformed into a playground. Original artwork for illustration on p22 of Look and Learn issue no 482 (10 April 1971). Available worldwide for immediate download up to 5,155 x 3,104 pixels.